What's really amazing about this grilled steak sandwich recipe, apart from its remarkable flavor, is just how easy it is to make. 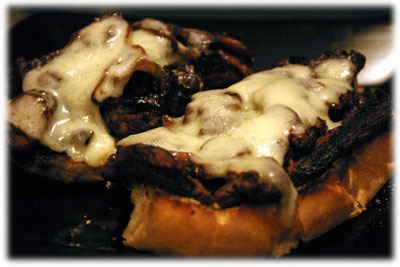 If you choose to serve this steak sandwich open like the picture below then consider topping it with these Balsamic fried mushrooms & onions (repeated below) and then heat the sandwich under the broiler a minute or so to melt the Swiss cheese. It can be disappointing making or ordering a steak sandwich only to find the meat is tough, dry and hard to chew. 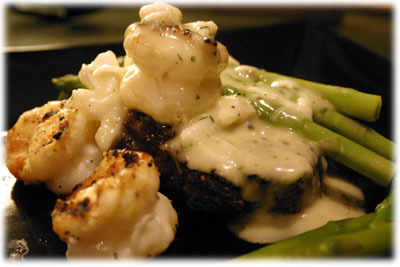 Since this recipe uses marinated beef tenderloin it guarantees you'll enjoy a tender, juicy steak sandwich every time. Also, if you've been hearing lately that steak isn't good for you why not take a moment and read the following article from Helen Nichols, editor-in-chief of Well-Being Secrets, "31 Science-Backed Health Benefits of Steak", significant research into the actual benefits of eating steak. 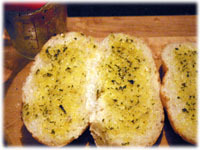 Tip: for melted garlic butter add 1 tablespoon minced garlic to 1/4 to 1/2 cup melted butter or try this garlic butter recipe here. 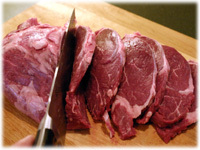 Either have your butcher cut the beef tenderloin slices for you or place the beef on a cutting board and carefully cut as many 1/2" slices as you'll need. Depending on the size of the beef your slicing, I recommend using at least 2 slices of grilled steak on each side of a split bun to make a full sandwich. 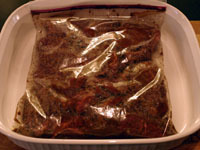 Place the sliced beef tenderloin in a resealable plastic bag. 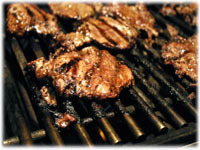 Prepare the grilled steak marinade by mixing the ingredients above in a small jar. 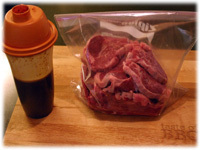 Pour the steak marinade into the bag, seal the bag and mix well so all the beef is covered. Place the bag in a shallow dish just in case the bag leaks and place it in the refrigerator for 2 - 4 hours. Clean and oil the grates of your BBQ and preheat to 600F - 650F. 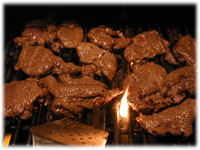 When the grill reaches this temperature range remove the slices of beef from the marinade and place on the grates. Close the lid for about a minute. 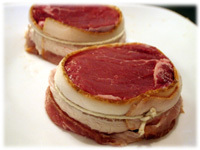 After a minute lift the lid and begin flipping the slices of grilled steak slices over. Important - these slices are only 1/2" thick so they hardly take any time at all to cook. Close the lid and leave for another minute. Remove the grilled steak from the BBQ and place in a shallow dish and cover with aluminum foil to keep warm and to allow the juices to redistribute back into the meat. 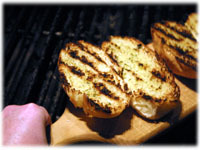 Split the soft panini or hoagie buns in half and brush with the melted garlic butter. Put the buns, buttered side down, on the hot grill. 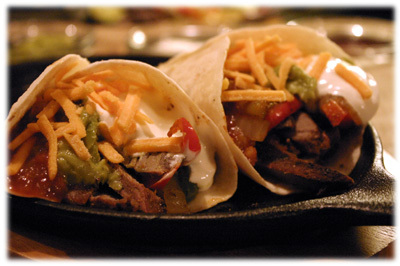 Don't leave these unattended - they take less then a minute to cook. After 30 seconds lift a corner of a bun to see how it's doing. When they're nicely toasted (and have those cool grill marks) then remove them from the grill. Place the toasted buns on a baking sheet. Preheat your oven broiler to 500F. 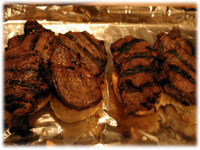 Place at least two slices of the grilled steak on each piece of toasted bun. 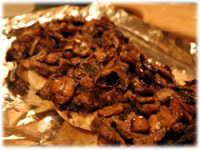 Spread the cooked mushrooms and/or onions on top of the grilled steak. Lay slices of Swiss cheese (or your favorite) on top of the steak, mushrooms and onions. 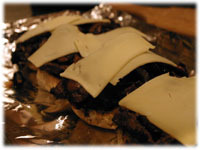 Shredded cheese is an option for this steak sandwich recipe but doesn't produce an evenly melted top like the sliced cheese does. Place the baking sheet with this sandwich under the preheated broiler of your oven just until the cheese is melted.